Tim and Angela Malyon live on and run Middle Coombe Farm and Coombe Farm woods. 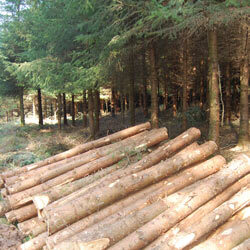 They have extensive acres of on-site woodland which they actively manage. The wood was planted from 1958 onwards by Tim's father and is mostly Larch and Douglas Fir. At the time he won awards for woodland management for his efforts. Softwood is generally ready for harvest earlier than hardwood and they have lots of nice mature trees. When they fell the wood they use all the parts of the tree with the larger portions going for building timber (they have shares in a sawmill and so mill up their own planks and lengths), the smaller diameter parts going for fencing or firewood. They only fell small portions of the forest and encourage self seeding to occur. Angela: It'll never be a big commercial business but it makes sense to do it and gives some local lads employment. I also learnt that species are far more abundant in woodland that is worked. I thought that was fascinating, I thought it would be the other way around. and then conveys them to the waiting dumpy bag. 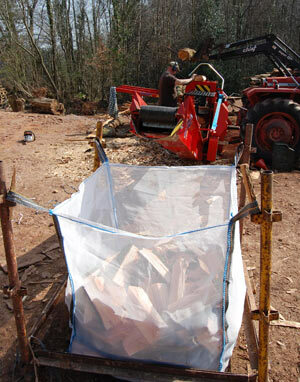 A firewood processor run off a tractor makes for a faster job of producing the logs. 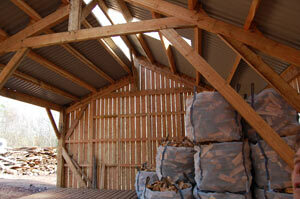 Mesh sided dumpy bags are used to hold the logs and these bags are then stacked in the drying barn. The drying barn can hold around 300 bags, with another 100 held in the adjacent barn where the building timber is also stacked and sticked in neat piles as it dries. I use these mesh sided dumpy bags myself and they are really great; they let the air in to season the logs and they are really easy to fill and to handle. I let the wood dry in the bag where I filled it and use the front end loader on our old tractor to lift the bags up when they are needed. You can lift two bags at once this way if you need to. After only a single season the wood is well below 20% moisture on the logs I measured - very good indeed. We installed an 80kW Angus Super log gasification boiler which feeds into a 4000lt Akvaterm accumulator tank. This connects to a small district heating underground loop which supplies Tim and Angela's house, the farmhouse (which is available to rent), and the cider barn where eco-weddings and functions are held. The system provides hot water as well as heating. Larch burns nice and hot and when I swept the chimney of their log gasification boiler the tiniest handful of deposits came out. This means that the boiler is running as it should and that the wood burns cleanly with little tar, contrary to popular conception. 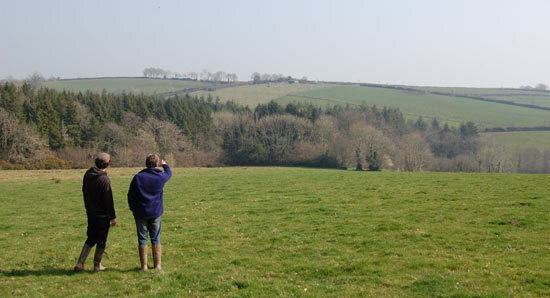 Below you can see Tim Malyon and Mike Gulley (our heating engineer) as we all admire the view of the woods.